Our Shipping Rate: $325.00 for pups 8-10 wks. $350.00 11 weeks and older. $100 and you pay for shipping COD at the airport. We deliver to Little Rock National Airport free of charge. Should your airport not allow COD - we will send prepaid. Once we have a quote from the airline - we will email you the total. All shipping fees will be paid prior to puppy leaving Hobbit Hill Kennel. Sample pack of Puppy Food. All puppies must be paid for in full before the puppy can be considered for shipping. All shipping fees must be paid in full before any reservations will be made. 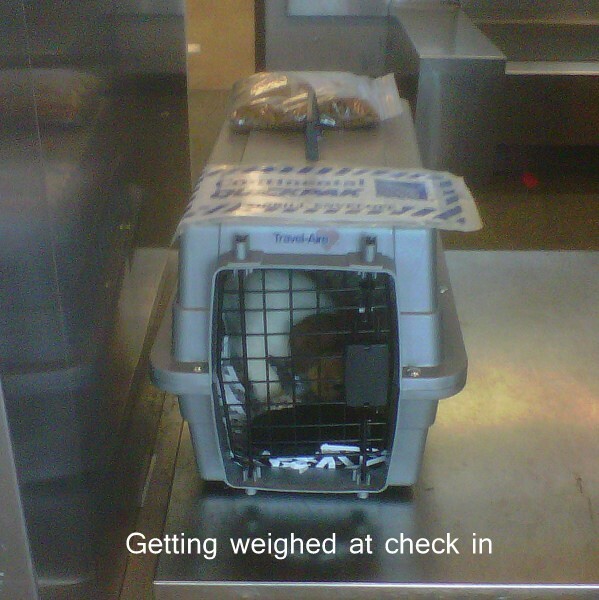 Pups are introduced to their crates to make them confortable in their traveling environment prior to being flown. Shredded paper is placed in the bottom of the crate. This adds comfort, absorbency, and keeps the pup dryer and more comfortable. The water tray is filled with water and then frozen. The pup can then lick at the ice while it slowly melts. This prevents the water from spilling and the pup having nothing to drink along the way. Your new puppy's food is packaged and will be taped to the crate. Airlines are given instructions to feed the pup on long layovers. All crates are airline approved. There must be adequate room for the pup to stand and turn around without space constraints. Remember - Your puppy never really knows that he/she is on an airplane, and he/she does not have a fear of flying. The best part is that he/she can be in your arms in just a few short hours. This is the most fun! Just simply show up at the cargo area. (Don't worry, your puppy won't come flying down the belt with all the suitcases.) Show them your photo I.D, and they will give your pup to you. Many families use this as the surprise introduction to their children or spouses. Have a camera ready! It's a good idea to bring some bottled water with you. When you get to a grassy area, (preferably away from the airport) let him/her out for a bathroom break. Don't forget the collar and leash! Once the bathroom break is over, you will find it more comfortable to travel with your new pup beside you on the seat. He will most likely go back to sleep by the warmth of your leg, this is a great first bonding experience. It's also not a bad idea to bring some wet wipes and paper towels along, just in case he had an accident on the way. The puppy and delivery price must be paid in full before delivery will be scheduled. Your puppy will be transported in a crate for it's safety. Sometimes it works out best for us to bring your puppy most or part of the way. Effective Summer 2013: We have made the decision to suspend our overseas exportation. We will be happy to ship anywhere in this country (except Hawaii) and Canada. We may change our policy at a later date. Thank you for your understanding. Mr. Handy- Manager in the Little Rock Cargo building.